Eurodata Sport, the company in charge of organizing the match, told Newsweek that the Nigeria squad would stage a game amongst its own players behind closed doors at The Hive, home of English League Two team Barnet FC. A statement published on the Nigeria Football Federation (NFF) website Sunday stated seven Burkina Faso players had been refused entry into the United Kingdom, ensuring the country could not field a full team. “There is no British Embassy in Ouagadougou, and officials of the Federation Burkinabe de Football had been shuttling between Accra and Ouagadougou for visa processing,” the NFF statement explained. “FBF [Burkinabe Football Federation] sources said the embassy in Accra told them last week to proceed to Morocco where the Etalons [Burkina Faso] played the Atlas Lions [Morocco] on Friday and that the visas would be issued there. “However, the applications were still pending at the British embassy in Morocco as at close of work on Friday, the last working day before match day in London. 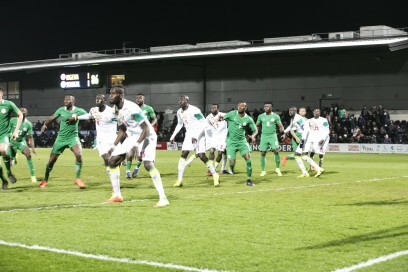 The match was meant as a warmup for Nigeria’s qualifying games this summer for the 2019 Africa Cup of Nations and FIFA 2018 World Cup in Russia. Nigeria is in London for a two-match tour. Gernot Rohr’s team drew 1-1 with Senegal at The Hive on Thursday evening, with the goal scored by Manchester City striker Kelechi Iheanacho.